Almost every battlefield can use some barbed wire! It makes for a great detail piece that can improve an existing terrain piece, or even stand on its own . This first technique we have for you is simple to make and inexpensive. 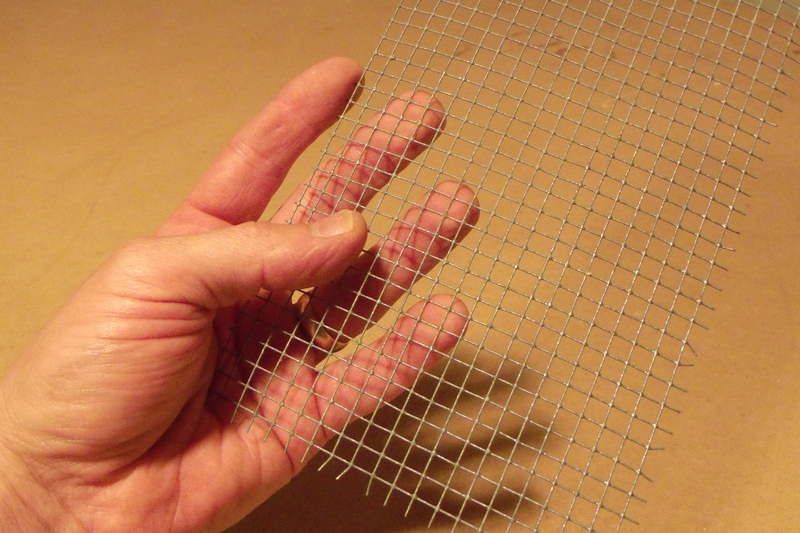 Get the smallest wire mesh you can find (It needs to be the type that has welded or soldered wires). You can find wire mesh at your local hardware store, typically in the gardening section. Remember that your barbed wire pieces will only be as long as the mesh that you choose. Even more importantly, remember that If you decide to spiral and condense the barbed wired, the end piece will be even shorter! 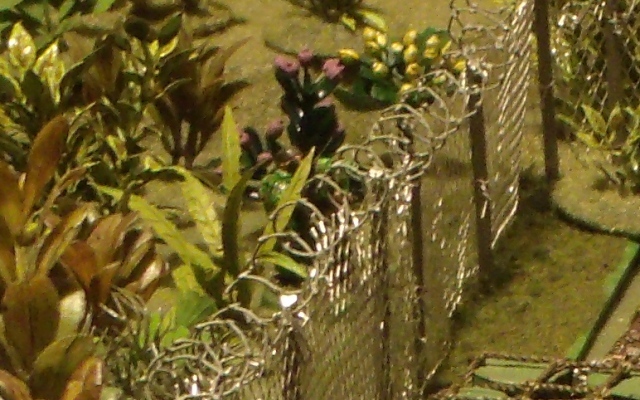 A seemingly large mesh could make a smaller amount of barbed wire than you would anticipate. It isn’t particularly hard to estimate, but it is easy to forget bout when you are out shopping. You can get smaller more realistic looking barbs making two cuts closer to the wires. Cut off long strands leaving the cross bars intact. If you want large barbs simply cut straight down the middle between wires. This is a really simple way of making lots of barbed wired quickly. The second method is more complicated, but makes a very realistic (or at least cool) looking wire. Start with window screening material; it must be the vinyl coated variety, and not the woven type. If you try using the wrong type it will fall apart when you cut it. The screen we used in this example was the heavy duty pet resistant variety. 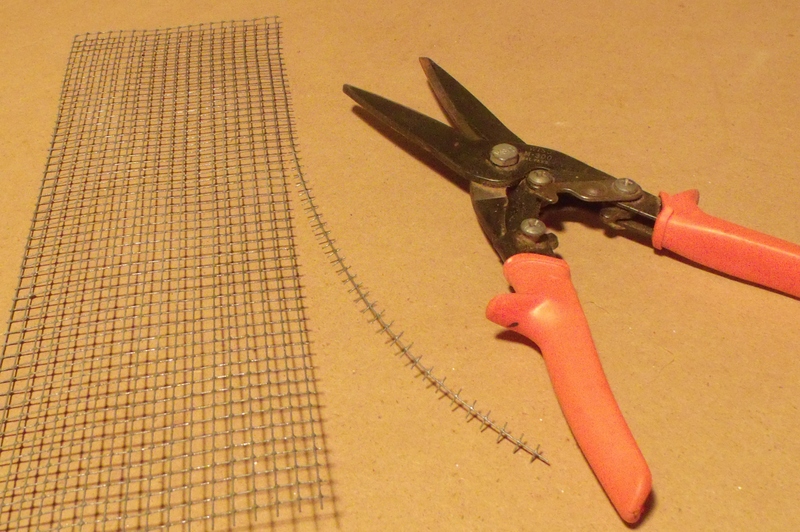 Now you just cut this into single barbed strips in the same manner as the wire mesh. Since the resulting strip is very soft it will have to be reinforced with some metal wire. You must use two wires together to lock the barbed string into place. If you only use one wire then it will simply unwind and fall apart. The three strands must then be twisted together using a hand drill. Make sure that the wires stay on the outside of the softer barbed strand and that you keep a little tension as you twist it. This process is a little tricky and may take a few attempts before you “get it”. 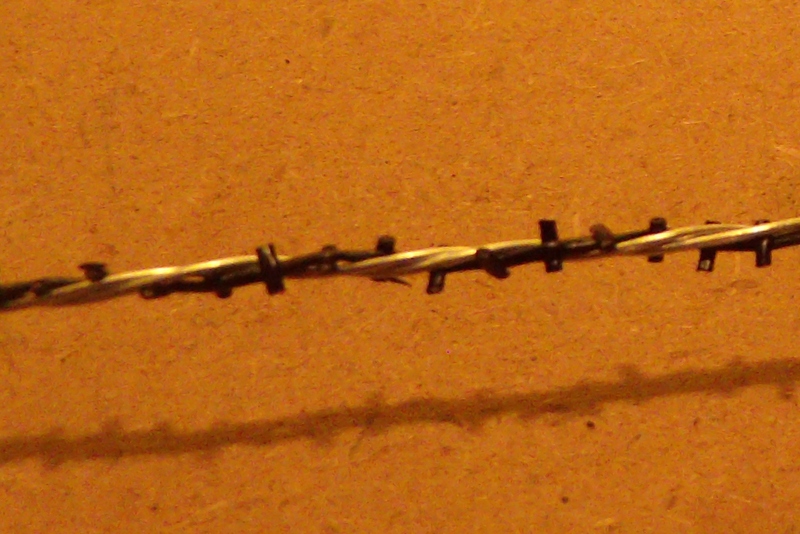 Once mastered, you will be able to make the barbed wire fairly quickly. 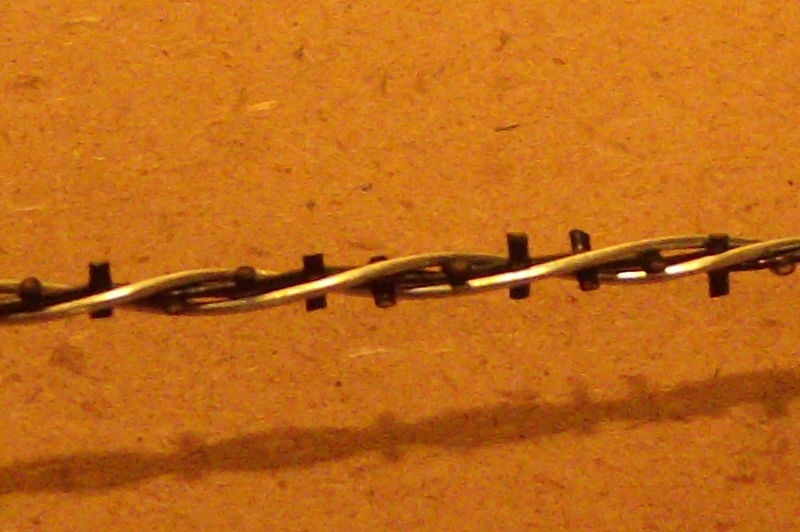 If you do it correctly, the two wires will wrap around the barbed strand evenly. Try to avoid this! If the barbs aren’t sandwiched, they will unravel easily once you let go. 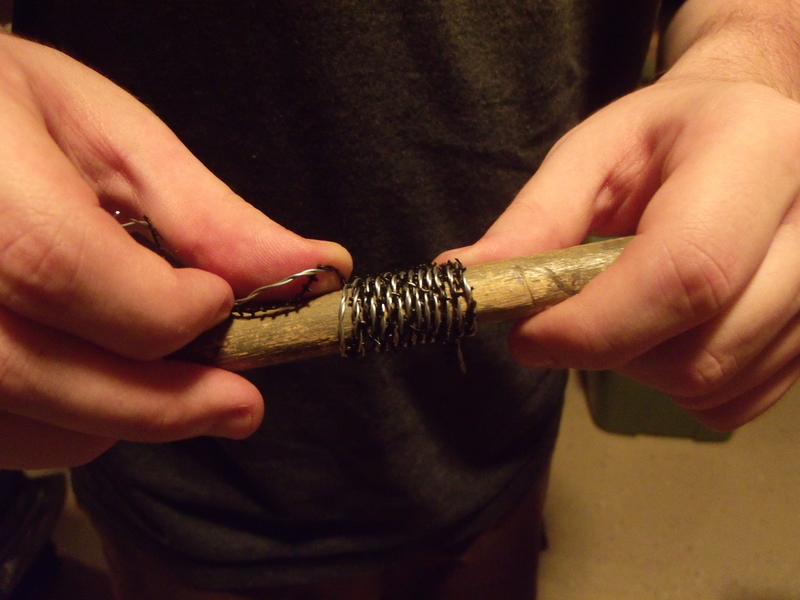 The resulting wire can then either be used, as is, or made into Concertina Wire (that spiral shape) by coiling it around a cylinder. Broom handles and pencils work great for this but almost any appropriately sized object will work. You will probably have trouble getting paint to stick to the vinyl, unless you use a “fusion” paint that “bonds to plastic”. Here you can see both of the techniques completed.